Want to become a reseller / distributor ? 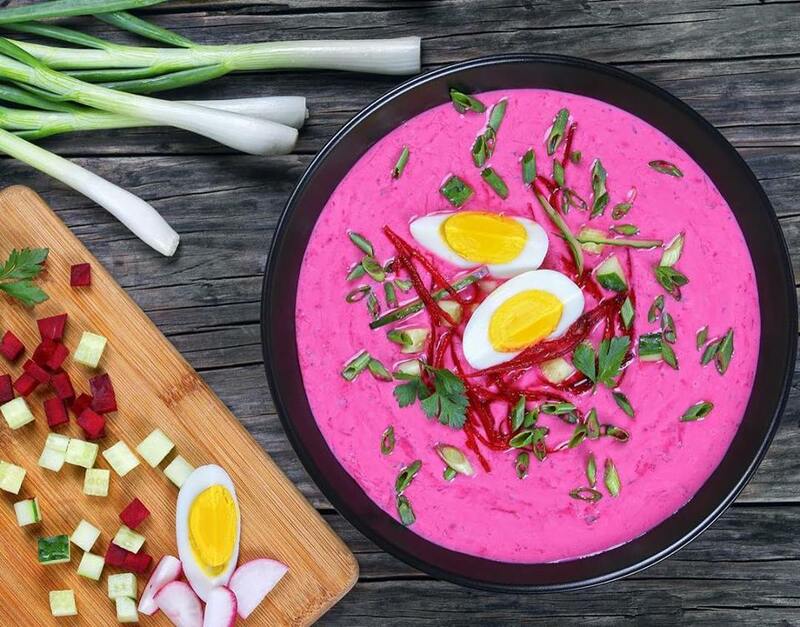 Once I had tried an ice-cold borscht on Kefir, I just fell in love with it! This borscht may well become a worthy alternative to the usual Okroshka with Kefir. In principle, the borsh version of cold borscht is not very different from the traditional warm borsch. The main difference is that, in cold borscht, boiled beetroots are added and such borscht is seasoned with Kefir. One interesting aspect: in cold borscht, do not include boiled potatoes; the potato is served with a borscht as an addition, and eat with a chilli. Prepare all the products on the list. First of all, boil the potato, beetroots and eggs. I usually boil the beetroots and the potato together in one pan. I cover the vegetables with cold water, let the water boil and cook them until they are ready. I check the readiness of the vegetables, by piercing them with a knife; if the knife easily enters the vegetables, they are ready. I merge the vegetables with water, let them cool completely and peel them. To cook the eggs, boil the water in a saucepan and gently lay the eggs into the water; cook hard-boiled eggs in six to seven minutes. I remove the eggs from the water, cool them and remove the shells. For the radishes and cucumber, cut them into strips or quarters. Spread the vegetables in a bowl. The eggs are cut into small cubes and also transferred into the bowl. The boiled beetroots are rubbed on a large grater. Add the beetroots to the rest of the ingredients in the bowl. Dill the greens and chop the spring onions finely. Spread the greens in the bowl. Mix well all the ingredients with the Kefir. If borscht turns too thick, add a little cooled boiled water. It’s time to salt the borscht. Put it into the refrigerator for 20 to 30 minutes. Pour out portions of the cold borscht on to plates, decorate with quarters of boiled eggs and serve with pieces of boiled potato and fresh bread. © Mount Olympus Pure Foods Ltd™ — All rights reserved. Join our mailing list and download this guide.